The hotel showcases a welcoming atmosphere that begins with the open log fires in the reception hall, and is carried throughout the property with its antique furniture, unmatched spa facilities, superb cuisine and friendly service. Rooms include complimentary Wi-Fi and use of Spa Salveo’s vitality pool and many suites include spectacular views of Croagh Patrick and Clew Bay and a complimentary decanter of port. The hotel's ideal location means that incredible local attractions including Knock Shrine, Foxford Woolen Mills and the Museum of Country Life are all just minutes away. 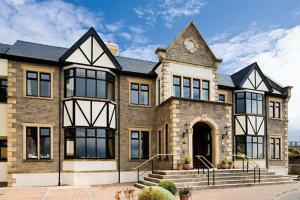 Set amid secluded grounds overlooking the picturesque town of Westport.